When you help the Association with your prayers and contributions, we are able to fulfill our mission of bringing Mary and Jesus to those who would otherwise not have the opportunity. Here is our newest program I'd like to share with you. Along with the Letters of Gratitude from our members. For hundreds of years, the rosary has played an important role in the history of the Catholic Church. It has brought forth countless miracles, resulted in millions of conversions, and brought comfort and peace to many. So many generations have enjoyed the many blessings through this simple, yet profound, prayer. But sadly, the same cannot be said for the younger generations. The Association is launching a new program called “Bring Mary to Kids”. The program’s ambitious goal is to rekindle an appreciation of devotion to Mary and encourage young children, and their families, to pray the rosary. The initial focus is to work with 2nd graders in Catholic schools. As they prepare to receive Jesus in the Blessed Sacrament, our hope is they will learn to come to him through Mary. Every student will be given a rosary, a Miraculous Medal, and an activity book teaching about Mary and the rosary. This packet is theirs to take home and, hopefully, share with their family. 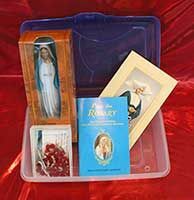 Each classroom will also be supplied with a Pilgrim Rosary kit containing a statue of the Blessed Mother, a rosary, and information on how to pray the rosary. The program calls for each child to host the kit in their home for one week. During that week, they are encouraged to learn and pray the rosary together as a family. The kit is returned at the end of the week so another student may host it in their home. Our goal is to roll this program out to any interested schools across the nation. In order to make this dream a reality, we need your help. First, please pray for this project and for the children. In the years since the Miraculous Medal was first struck, Mary has touched the lives of hundreds of millions who have worn her medal and trusted in her intercession. When Saint Catherine saw the vision of Mary with brilliant lights streaming from the rings on her fingers, she noticed that light did not flow from some rings. Mary said, "These gems from which rays do not fall represent graces for which people forget to ask." Please consider spiritually adopting these children by praying that they receive many graces! Finally, we ask that you consider making a donation to help us offset the cost of this program. We want to get these materials to as many kids as possible. While we have kept the overall cost of this program as low as possible, it nevertheless requires time and money. Please help us bring Mary to these children. Could you consider giving $15, $30, or $50? The results will be miraculous. Read the Letters of Gratitude of your commitment to help us spread devotion to our Lady of the Miraculous Medal.